served at local seafood restaurants. sun ripened chili peppers, distilled vinegar, garlic, sugar, and salt which are ground into a paste and packaged in a convenient squeeze bottle. In Thailand the sauce is most often called sot Siracha. 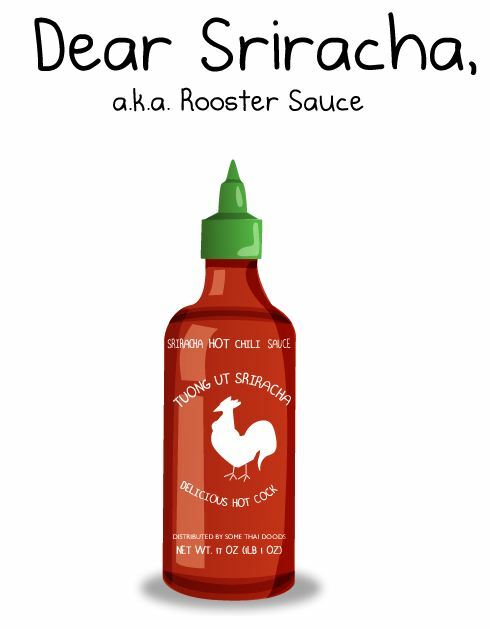 Sriracha is excellent in and on soups, sauces, pastas, pizzas, hot dogs, hamburgers, dumplings, chow mien or on anything else for that matter. What ever you add it to the result will no doubt be delicious, unique and spicy. Traditional Thai Sriracha sauce tends to be tangier, sweeter, and runnier in texture than non-Thai versions. Sriracha is used as a topping for phở in Thailand, where it is frequently used as a dipping sauce, particularly for seafood. In Vietnamese cuisine, Sriracha appears as a condiment for fried noodles, spring rolls and in sauces. How addicted are you to Sriracha Hot Sauce? Take the Quiz on The Oatmeal. Click Here. Spice it up & add Sriracha to your Mayo. A Love letter to Sriracha. Click to go to The Oatmeal.